Although it’s been almost 4 months since our reunion the word that stills comes to mind is “WOW”. What an absolutely fantastic reunion! Our hats are off to Fayne Haynes and his family. Fayne’s daughters Janice Bellamy and her husband Jim and Anita Stanley and her husband Randy did an amazing job! What gracious and wonderful hosts they all were! 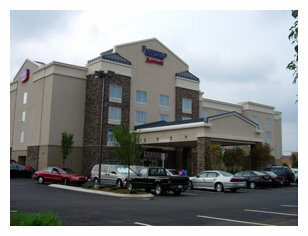 Things got off to a great start on Thursday as folks began checking in to the brand new Fairfield Inn and Suites. What a beautiful hotel! The young lady at the reception desk couldn’t have been nicer. It proved to be just the beginning of the fine “southern hospitality” we would be met with during our entire stay. Once we got checked in and stowed our bags in the room we headed straight to the hospitality room. We were pleased to see that quite a few folks were already in attendance. Tena was already hard at work selling raffle tickets at her registration table. Good thing we had checked into our room already as she quickly put us to work. Just kidding. She let us say hello to a few folks first and then she put us to work! The Haynes Family had made lovely notebooks for everyone (they were TDB orange at that!) Each notebook held an itinerary, maps and brochures of things to see and an American flag. We were also given a pre-printed nametag to wear. Rick got right to work setting up his computer workstation. We were very fortunate that the hotel provided a DVD player and large television in the hospitality room. 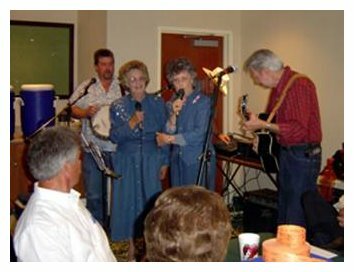 Rick had previously recorded photos from prior reunions onto discs and was able to play them for everyone. We also had all of our photo and written history books placed throughout the room so folks could enjoy them. I can’t remember if it was Thursday evening when the food began arriving but I do know that I have never seen so much food throughout the entire weekend. Iris Morris brought a yummy dessert, Salted Peanut Chews. (click here for the recipe) Anita Stanley brought cupcakes, brownies and a jello salad. Janice Bellamy provided a wonderful chicken salad. Hazel Scott brought a pound cake. Sara Avery brought a red velvet cake and a German Chocolate cake. 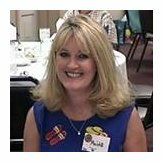 Diane Kelton made spaghetti and a delicious peach cobbler (which I was supposed to get the recipe for – Diane if you could send it to me, I’ll include it in the next newsletter). She also brought huge loaves of hot bread. Ruth Riley brought zucchini bread and Frances Bertrand prepared a roast and a fig cake. Geneva Smith (our Moon Pie lady) didn’t let us down – she brought tons of them! Ouida Raulins brought peaches. Bill Hawkins brought along some of those delicious Ripley tomatoes. All that food and it was in ADDITION to all of the wonderful food the Haynes Family provided for our Friday night bar-b-que and our banquet on Saturday evening! Thank you to everyone for your generosity in providing us with such excellent meals. Thanks also to Mary Ann Wesoly and her cousins Sandy and Steve Ennis for providing all of our Coca Cola products. Luckily the Haynes Family had some tours scheduled for us on Friday morning (we had to do something to work off those calories!). Our first stop was a tour of the Haynes Museum. It was awesome. No wonder Mr. Haynes is so proud of it. 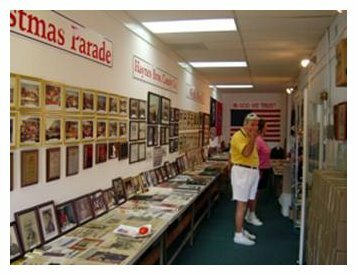 Various sections of the museum cover the history of the Haynes Candy Company as well as a section of “Life on the Farm” and a section titled “Christmas Parade”. Of course the section that was most impressive was the history of the 612th from Camp Bowie to present day. What a treasure. Thank you Mr. Haynes for sharing it with us. After leaving the museum we headed over to Cannonsburg Village for a walking tour. Cannonsburg is the original name of Murfreesboro. The Village began in 1974 as an American Revolution Bicentennial project. 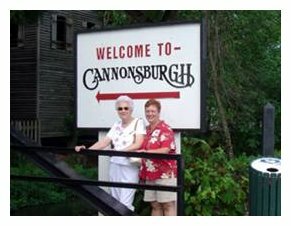 Cannonsburg Village takes you on a tour through 125 years of southern rural life. After our enjoyable tour of the homes and buildings in the village we took a quick detour over to an outdoor produce stand. Glyn Sain was looking for tomatoes to slice for lunch (Mr. Hawkins had not yet arrived with his Ripley tomatoes). While Glyn searched for tomatoes I was on the lookout for fried pies. Dorothy Tomlinson introduced me to fried pies while we were visiting her in Memphis prior to the reunion. Unfortunately there were no fried pies to be found so it was back to the hotel to greet our latest arrivals. We made it back just in time to greet Bill and Earlene Hawkins and their daughter Jeannie as they were checking in. We all headed down to the hospitality room and were happy to see Rufus and Pearl Noland had arrived with their daughter Nancy Ewing. Rufus was a delight. He kept us laughing all weekend with his memories of the war. On Saturday I was registering our veterans for the World War II Memorial in Washington, D.C. When I asked Mr. Noland what he did in the war he replied, “Run, mostly”. He also had us cracking up when he was sitting across from Iris Morris. He looked across at Iris and asked, “Back when I knew you, who where you?” Iris told him her name and that she was the widow of Charlie Morris. Mr. Noland then went on to entertain us with his stories. To me that is what the reunions are all about. Thank you, Rufus! While I chatted with folks, Rick got right to work making a DVD of photos from the tours we had taken that morning. Within half an hour we were all watching photos of our day’s adventures (That's Grandma and Grandpa on the TV behind the kids). Before we knew it, it was time to vacate the hospitality room so our hosts could get things ready for that evenings festivities. Once again Janice and Anita out did their selves. The decorations at the Friday night bar-b-que were resplendent in red, white and blue. After another outstanding meal (we had 51 guests in attendance) everyone had a great time playing bingo with prizes that the Haynes family generously provided. Bright and early Saturday morning folks started bringing in their prizes for that night’s Flower Fund Raffle. We held our annual business meeting at 10:30 a.m. Jewell Raulins chaired the meeting for us. I presented the proposed dates and locations for our 2006 reunion. 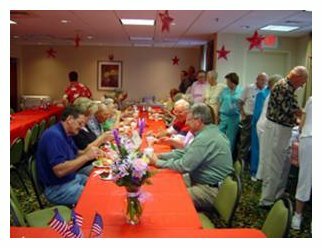 After some discussion is was agreed that our next reunion will be held from July 27th through July 30th 2006 in Tarpon Springs, Florida. Iris Morris asked to say a few words. 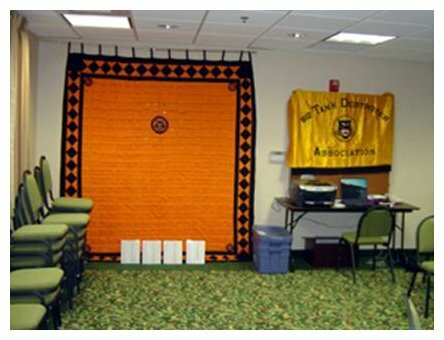 Since she made our beautiful 612th quilt several years ago - lovingly inscribed with the names of our men - we have been trying to find an appropriate place to donate it to when the time comes. When she had toured the Haynes Museum on Friday she said she finally knew where she wanted her quilt to go. She told Mr. Haynes that she would love for the quilt to hang in his museum. Mr. Haynes graciously accepted and will proudly display the quilt in the Haynes Museum. 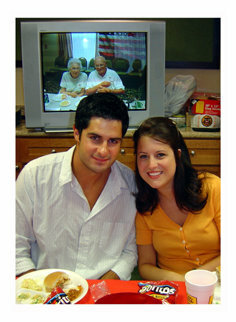 He promised to make sure that it is on display at future reunions. Tena reported that our bank balance was $1,969.85. Iris made a motion for the flower fund to be available to Tena to cover reunion expenses. Susie seconded the motion. The motion was approved. One other item that we touched on lightly was what to do with our leftover funds when and if the time comes that we no longer hold reunions. So please, give it some thought and share your ideas with us. Hopefully the time will never come but it would be good to have a plan of action. After the meeting . . .
Folks spent the day visiting and catching up with old friends and meeting new ones. I was pleased to finally meet Dean Uhles. I have heard so much about her and was really pleased to be able to finally meet her. Sadly the day passed much to quickly – before we knew it, it was time for the banquet. But first we all gathered together in the lobby area for our annual group photo. 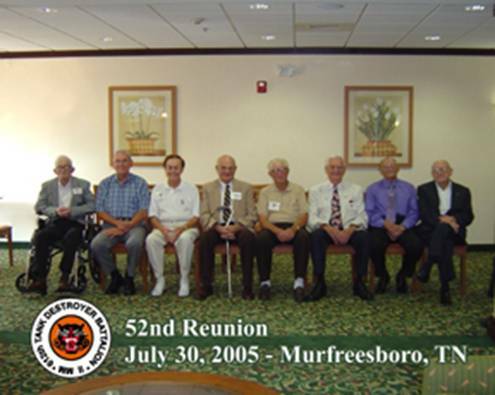 Eight veterans attended this year’s reunion. Rick managed to get everyone in the picture in a fairly timely manner and we all headed down the hall to the hospitality room. Once again Janice and Anita had worked their magic. The room was aglow with orange candles interspersed with black and orange decorations made of ribbons and lace. It was beautiful! We had a full house with 74 people present. Mr. Haynes made a few brief announcements and welcomed everyone. Donn Fischer was celebrating his birthday so we all serenaded him with the “Happy Birthday” song. Following the Pledge of Allegiance, Our chaplain, Earl Sain led us in prayer. Our excellent buffet supper was followed by another treat, “Sisters of the South”. Members Sophie, Louise, Floyd and David provided us with excellent musical entertainment. Following the music we had a guest speaker – who I apologize too as I can’t recall his name! He was a Vietnam veteran who trained and worked with bomb and drug sniffing dogs during his tour of duty. Of course no 612th banquet would be complete with out our Flower Fund raffle. 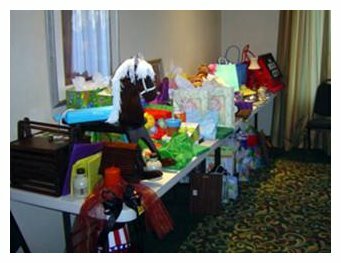 The gift tables were piled high with wonderful prizes that our folks had donated. I think Iris Morris and her friends Evelyn Tallman and Flo Lefton needed to rent a U-Haul to get all of their winnings back to Indiana. The Riley’s did pretty well also! Wanda O’Kelley, Iona Nix’s niece, was the winner of one of Talmadge Riley’s coveted rocking horses, lucky girl! Sunday morning arrived much to quickly. It was time to wipe away a few tears and for one last hug goodbye to our dear 612th friends. But thankfully there is always next year and the plans are already set in motion for our 53rd reunion. · William “Bill” Hawkins – “B” Co.
· Elmer “Fayne” Haynes – “B” Co.
· Rufus Noland – “B” Co.
· Talmadge Riley – “B” Co.
· Jewel Raulins – “A” and “B” Co.
· Avery Sanders - “C” Co.
· Tena Phillips (Travis) “B” Co.
· Hazel Scott “A” Co.
· Judy Ramhoff “B” Co.
· Iris Morris (Charles) “B” Co.
· Susie and Rick Pidsosny “A” Co.
· Mary Ann Wesoly “A” Co.
· Iona Nix “B” Co.
· Judy Odum “B” Co.
· Ouida Raulins (Jewell) “A” & “B” Co.
· Sara Sanders (Avery) “C” Co.
· Diane and Jimmy Kelton “C” Co.
· Ruth Riley (Talmadge) “B” Co.
· Ronnye and Janice Riley “B” Co.
· Frances Bertrand (Frank) “A” Co.
· Joni and Frank Bertrand Jr. “A” Co.
· Earlene Hawkins (Bill) “B” Co.
· Jeannie Hawkins “B” Co.
· Pearl Noland (Rufus) “B” Co.
· Nancy Ewing “B” Co.
· Beatrice Haynes (Fayne) “B” Co.
· Janice and Jim Bellamy “B” Co.
· Anita and Randy Stanley “B” Co.
· Don and Eileen Haynes “B” Co.
· Melvin Haynes “B” Co.